It's been a fun car with a known history in Ohio rallycross. I've had it a few years, new brake pads front, all new everything brake-related in back, year-old battery, new fuel tank and filler when I bought it (not cheap). @Eastsidemav helped (ie did everything) make the light bar in front and added Hella 500's. Subaru vinyl on the side, professionally plasti-dipped front end and hood (thanks Rob). It isn't perfect, but I can beat it to hell rallycrossing and drive home no issues. Drove it all the way to Nebraska 12hrs to compete in the Nationals for 3 days, then home, again no issues. $5k firm, because I need that for my next adventure. Anyone interested? Interested? Yes. Feasible? No. Good luck! If I had kept my 2.5RS I would be rallyxing it now. I think rust in the name might turn some folk off. Isn't the rust pretty much all just cosmetic, though? I thought I got a look up under her skirt as it were and it was still solid on the parts that count. Mostly. Typical rear wheel wells, and under the side trim. 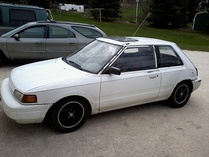 ...no one needs a fun winter beater? More detailed pictures and info may help your cause. Is there any way to edit the title? Because $5k firm is not so firm anymore, more like $5k or best offer... I've decided I do want an early WRX after all.